A fast and easy way to chop vegetables, make salsa, mix deserts, whip eggs and so much more. This simple and effective tool makes a great alternative to more expensive electric versions, and it offers similar speed and functionality at a fraction of the cost. It is perfect for chopping any kind of veggie, but it is especially nice for onions because it prevents tears by keeping everything sealed inside the container. Use for a single item, or do several at once for mixing and chopping that happens all at once. Chop up salads and coleslaw, or produce a home made salsa with ease. Switch to the mixing blade to whip desserts, blend fluffy omelettes, or stir pancake batter. You can even chop to a puree for nutritious baby food made right at home. Easy to assemble, and even more simple to operate, this great gadget allows you to chop with speed and accuracy by just turning the handle. Don't waste energy with a knife, only to get uneven results. Save time, effort, and dishes when you use this tool instead. Versatile. A chopping tool, mixing tool, manual blender, salad spinner and more. This gadget will replace several others, and allow you to save time over doing things by hand. Powerful. The crank handle multiplies your effort to cut food faster. A double blade design cuts more times with each rotation. Enclosed. Great to prevent tears while working with onions, but also nice for storage, reducing mess, and working at high capacity. This feature also keeps odors locked inside, and prevents liquids from leaking. Salad Spinner. A useful attachment unique to this chopper, the rotating basket can pull moisture from lettuce and other greens in a matter of seconds. Just install instead of the blade to spin dry veggies after washing. Whipping Blade. Mix batter, stir dressings, whip eggs and more. As a chopping tool, this item is great, but this additional part allows for all sorts of additional functionality, so you get even more value out of this already incredibly useful gadget. Compact. Large enough to provide plenty of capacity, but easy to store at the same time. All parts fit within each other to make finding a spot in the cupboard easy. Easy. Effortless to use, and simple to clean up afterward. Quickly switch out attachments to go from chopping to blending. No complicated steps necessary. Versatile and powerful, this tool can be used for all sorts of jobs and recipes. It will cut down on effort and amount of time spent as it produces quality results that taste great. Check out the list below to get started, but use for any other similar task as well. Looking for something a little more fancy? For a model that comes with more attachments, triple blades and a side handle, check out the Ultra Chef Express or the The Kitchen Plus. Prefer a simple tool, but looking for a different type of blade, or a spout on the side to pour stuff out? Check out the Salsa Express Miracle Chopper. It is a simple model like this one, but it does offer some distinct differences that some may prefer. 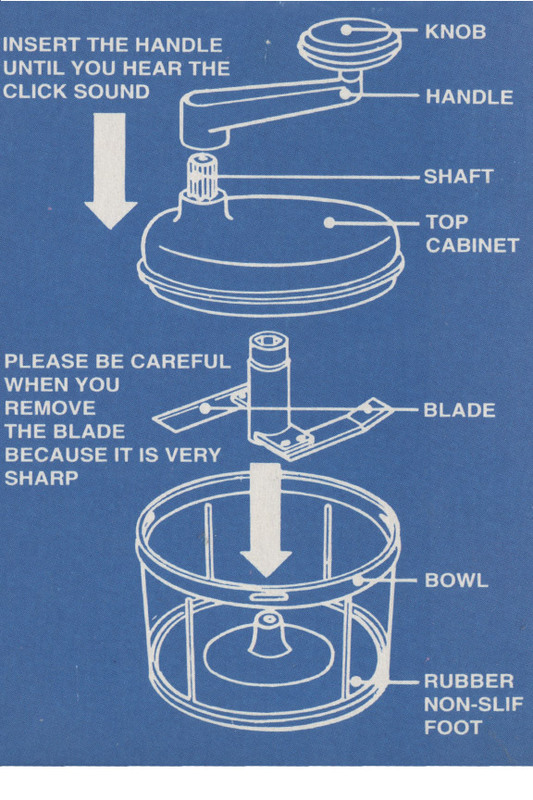 Carefully assemble by placing the blade into the bowl. Avoid touching the cutting blades as they are extremely sharp. Place your ingredients into the bowl. To ensure best performance, make sure the bowl is not overloaded, and make sure pieces are not too large. Place the lid onto the bowl and then give it a 1/4 turn in the clockwise direction to secure in place. Insert crank handle into drive shaft at the top of the lid, and press down firmly until it clicks into place. To chop, turn the handle in a clockwise direction. Cut fruits, vegetables and meats to desired consistency, and keep track of your progress by looking through the clear bowl. Once chopping is finished, carefully remove to use or serve, and avoid contact with the cutting edge. Hand washing is best when dirty, but it is also top rack dishwasher safe. Chop a single vegetable, or combine several to cut and mix at the same time. To blend or dry salad, simply replace the metal blade with the whipping blade or spinner basket and use as instructed above. 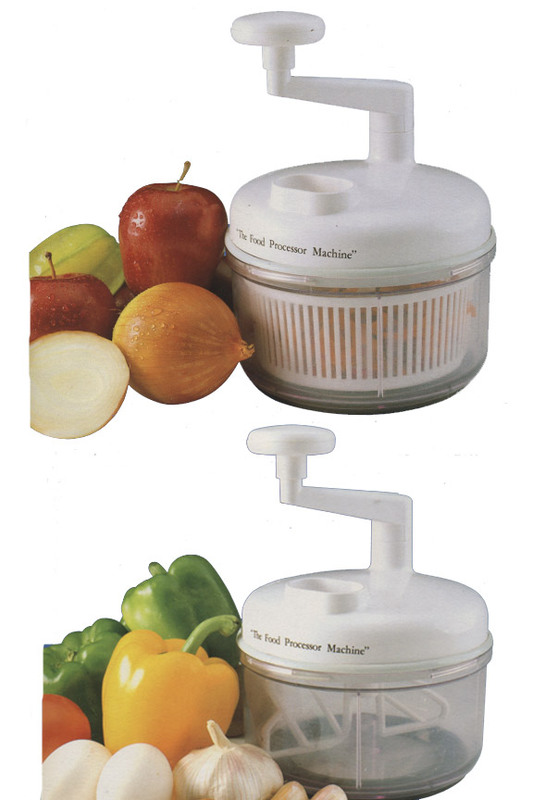 Dimensions 7" x 7" x 10"
A powerful chopping and mixing tool that will save you time and money. A simple spin of the handle will chop food much faster than you can with a knife. Order Yours Today! I have ordered this chopper before, but this one doesn't look like it has a handle? I like the 2 blade better then the 3 blade, but i also like the handle, so does this one have a handle? This model does not have a side handle. Check the other options we carry if this is important to you. A 7 in 1 Kitchen Miracle. Prepare Food in Seconds! A High Quality Vegetable Chopper From Dalla Piazza. The Ultimate Manual Mixer! Mix, Blend and Chop. 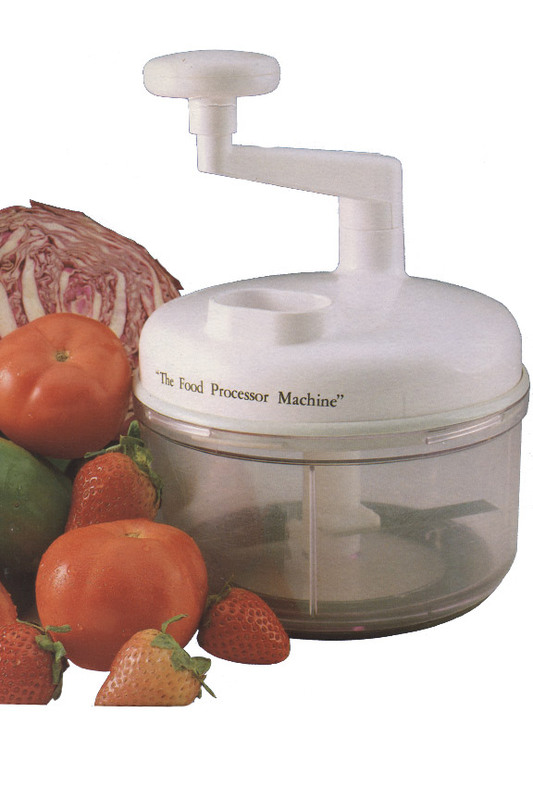 A Salsa Maker, Food Chopper, Mixer, & Blender In One! Quick Prep And Easy Clean Up. Fine Or Course Chopping In Seconds.